No luxury. Rustic bungalows (huts) and rooms with a touch of sophistication that comes from the unique and personal decoration of each room. Only 8 cabins/huts (bungalows) give a cozy ambiance and friendly atmosphere. Some rooms come a thatched roof. You are downtown Puerto Morelos, two blocks from the main square on the West side of Highway MX307; however you will wake up to the multiple songs of the birds. Less than five minute drive to the beach (1. 8 miles). We rent bicycles (at extra cost) so that the beach appears even closer. Easy access to cheap public transportation (minibus or taxis). The first class long range bus station (ADO) is 3 blocks away, within walking distance. In the heart of the local population: this means that you can find plenty of affordable and tasty small restaurants and eateries within 2 or 3 blocks around the property. Convenient stores, mini-market stores and also fruits and vegetables stands are nearby: get a quart of freshly squeezed juice for less than MX$20. 00 Pesos. 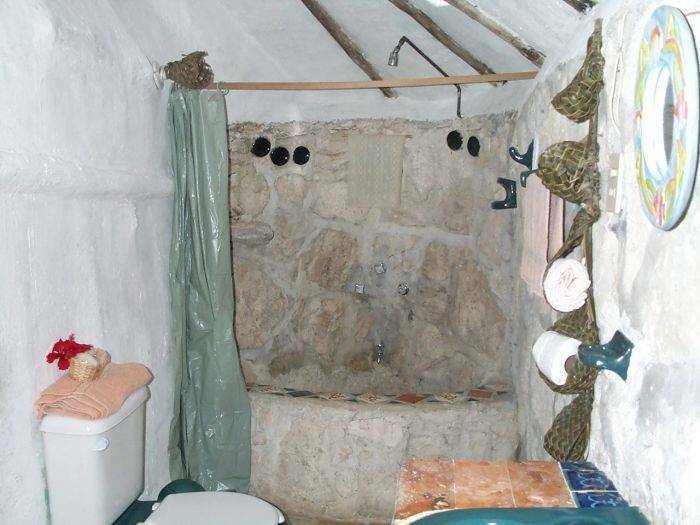 a bedroom with its private bath (with hot water in the shower). each room comes with one full-size bed. Some rooms have also an extra individual bed. a fan in each room - No A/C: the natural breeze, the shade provided by the vegetation and the traditional materials used in the construction of the bungalows help provide room with a nearly constant temperature. wireless internet access (bring your own laptop or smart phone). The room #8 does not have WiFi coverage. We (the owners) live on site most of the time and we love to do our best to make sure that your stay will meet all your expectations. We have friendly pets on site: three dogs are also full time hosts. Your pets are welcome if they are well behaved and friendly to other pets and humans. They are NOT allowed to jump on furniture, to be on the bed / to be in the bed. 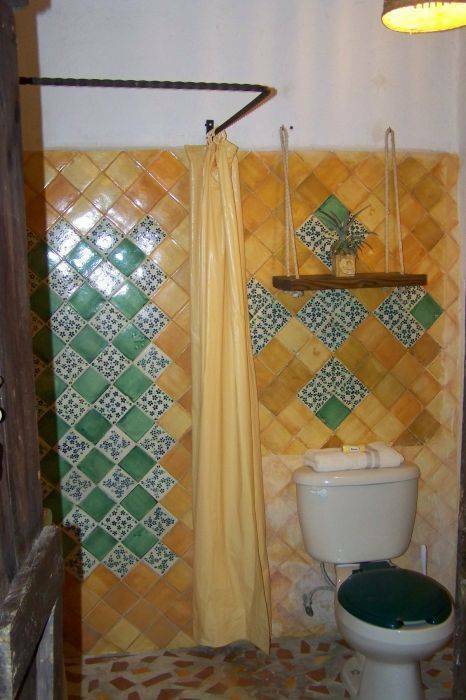 - All rooms and bungalows feature bedding for one or two persons and a private bath with shower. Some bathrooms come with a bathtub. Hot water supplied in all showers. Bedding is on one full size or one queen size bed. No A/C - air conditioned: however a pedestal fan or a ceiling fan is provided in each room. Wireless internet access (high speed up to 1. 0 Mbps) can be accommodated at extra cost on long term rent (free on short term rent): bring your own laptop or smart phone. On-street parking: no off-street parking. 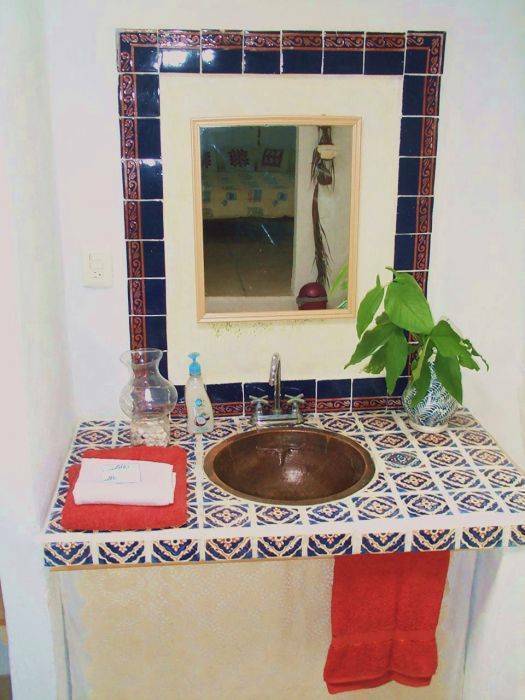 Unique decor in each room with original pieces of art, Mexican artifacts, and original paintings from the owner. Local wood accents and handcrafted furnishers. Hammocks in some rooms - Hammocks in the common areas. ALL rooms have: - all rooms are non-smoking. However, you can smoke in the yard / gardens - all rooms have bedding for 2 persons on one full-size bed - all rooms have a private bath with hot water in the shower - all rooms have mosquito screens on all openings - all rooms have either a pedestal fan or a ceiling fan - All rooms have a unique decor with original pieces of art, Mexican artifacts, and original paintings from the owner. Local wood accents and handcrafted furnished. 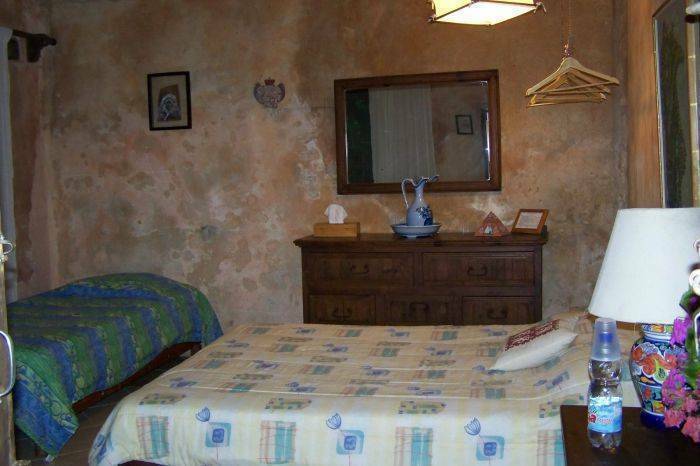 - all rooms have a wireless internet access (high speed up to 1. 0 Mbps). The room #8 has a weak or non existent WiFi signal. In the heart of downtown Puerto Morelos, on the west side of the Mexican highway 307, Casitas Kinsol is tucked in a luxuriant vegetation and you will wake up to the multiple songs of the birds. In the heart of the local population: this means that you can find plenty of affordable and tasty small restaurants within 2 or 3 blocks around the property. - 50% deposit upon booking to hold and confirm the reservation. - The reservation is confirmed when the payment is received. - Cancellation received 31 days (or more) prior to arrival will qualify for a refund of the total deposit, minus a $50.00 which is a refund commission. - Cancellations received less than 30 days prior to the arrival date will forfeit the entire rental amount, unless we are able to re-rent the room (minus the $50.00 refund commission). - We will make every effort to re-rent the room. If we are able to rent the room for the time-period subject to cancellation, we will refund an amount equal to the rent actually received minus the $50.00 refund commission. - No refund in the event of early departure. - Payments with credit/debit cards are NOT accepted on the site. - Payments with Paypal are NOT accepted on the site. - A $250.00 damage deposit in cash upon check-in payable on the site (on long term rent only - more than one month). - Refundable at check out if no damage nor breach of the lease agreement occurred. - Check-in at anytime later than 3:00 pm. - Check-out at anytime prior to noon. - Check-in time may be accommodated earlier, and check-out time delayed, depending on previous and following re-rent. - Linens are provided (on short term rent only). - Extra maid service available: $15.00 per service. - Wireless internet access is free on short term rent (and available at extra charge on long term rent - one month or over). Casitas Kinsol is located in Puerto Morelos on the Mayan Riviera, south of Cancun, 16 miles from Cancun international airport. It is half way between Cancun and Playa del Carmen: the perfect location if you plan to explore the Mayan Riviera. Take highway MX307 to Tulum. When you get to the entrance of Puerto Morelos, take the frontage road on your right (leave the ramp to the bridge on your left). You get to a stop sign; go straight. Leave the Pemex gas station and the 7-Eleven convenient store) on your right. Take a right on the first street (just behind the 7-Eleven store). Take a right on the 4th street / avenue that you encounter; you'll be a on wide and divided avenue (this is Zetina Gazca Avenue). Go North 2 blocks. Casitas Kinsol is on the right end side (on the left side of the avenue is the old market). You'll see a coconut tree on the sidewalk; Casitas Kinsol is the next property. There are 2 gates: the last one on your left is the main entrance; pull the bell !!! Take highway MX307 to Cancun. When you get to the entrance of Puerto Morelos, take the frontage road on your right (leave the ramp to the bridge on your left). You get to a stop sign; take a U turn under the bridge. Leave the Pemex gas station and the 7-Eleven convenient store) on your right. Take a right on the next street (just behind the 7-Eleven store). Take a right on the 4th street / avenue that you encounter; you'll be a on wide and divided avenue (this is Zetina Gazca Avenue). Go North 2 blocks. Casitas Kinsol is on the right end side (on the left side of the avenue is the old market). You'll see a coconut tree on the sidewalk; Casitas Kinsol is the next property. There are 2 gates: the last one on your left is the main entrance; pull the bell !!! door to door thanks to taxis or collective vans. The prices vary with the companies. Just do a search over the Internet with the following keywords: Cancun airport shuttle taxis. you can also take a bus that would drop you at the bus station in Puerto Morelos, 4 blocks from Casitas Kinsol. The cost is MX$110. 00 (as of January 2018) per person. Make sure that buses are scheduled at the time of your arrival in the airport of Cancun. From the bus station to Casitas Kinsol, you can either walk or take a taxi (cost of around US$2. 00). You can either take an "ADO" bus or a minibus / van ("transporte colectivo"). The ADO buses are non-stop from Playa del Carmen to Puerto Morelos. The "transportes collectivos" stop wherever some one ask for a lift or a drop-off. Either mean of transportation will drop you on the frontage road on the East side of Highway MX307, in front of the Pemex gas station. 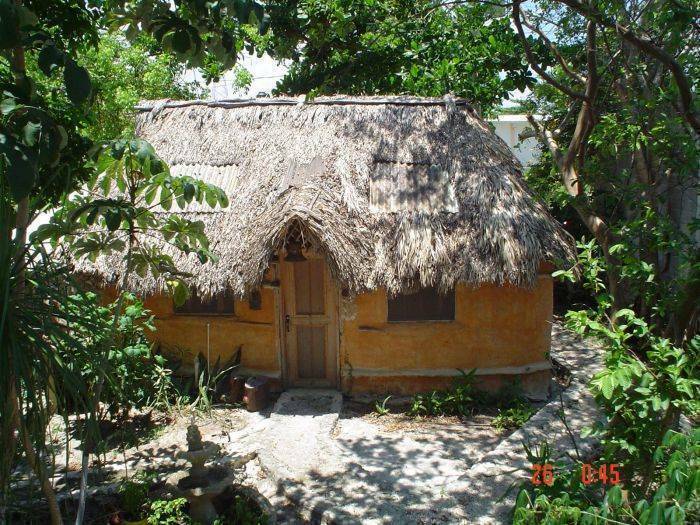 With easy access to cheap public transportation (minibus or taxis), Casitas Kinsol is less than ten minute drive to the white sandy beach of the small fishing village of Puerto Morelos (2. 0 miles).